"Truth is my weapon of choice; I will seek it and I will speak it." done so by something or someone other than myself! The same thing is happening in my house. On this wiki-page quotes that I, Artsieladie, aka Sharon Donnelly, aka [Galadriel], have written, are being displayed. Artsieladie and/or Sharon Donnelly" "accompanied with it", so the credit of writing the quote remains with its author, yours truly. In regards to any and ALL of my creative works, including written works, please also see: Public-Notice_By-Artsieladie. 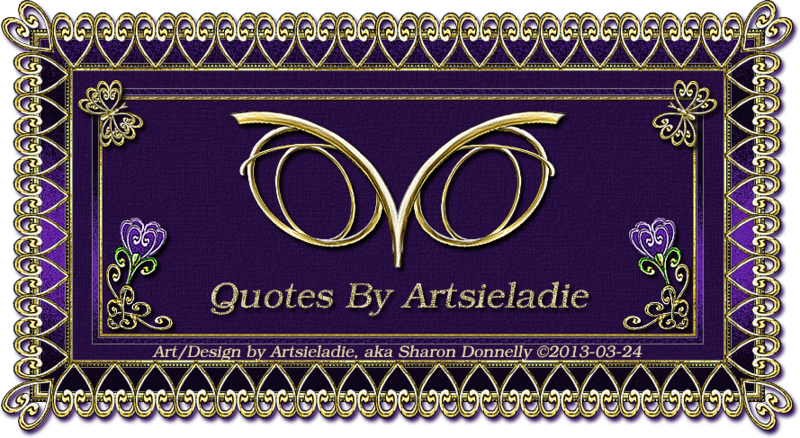 All quotes and graphics on this page are copyrighted to Artsieladie, aka Sharon Donnelly, [Galadriel]. All rights reserved.